All natural essential oils. Provides protection from biting insects. Glows like a lantern. 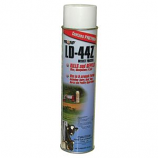 Protects a 300 square foot area. .
Repels mosquitoes and biting flies. All natural essential oils. No poisons. Protects an area up to 300 square feet. .